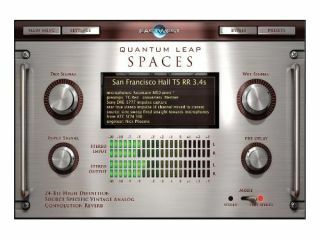 NAMM 2011 PRESS RELEASE: EASTWEST, the industry leader in virtual software instruments, announces Quantum Leap Spaces, a new, 24-bit true stereo convolution reverb that sets a new standard by utilizing new impulse recording techniques developed over the past seven years. An arsenal of the best gear that Neumann, Neve, Telefunken, TG, Manley, Sennheiser, Fairchild (to name a few) have produced over the past 60 years was used to create Quantum Leap Spaces, along with the Sony DRE S777 sampling reverb and Meitner A-D converters. ATC monitors were positioned in the room/hall to emulate the real world sound projection properties of various instruments. For example, firing the sweep tones from the middle to left rear of the stage, backwards and slightly towards the floor created an impulse taken for a French horn. 1st violin section impulses were taken by firing a series of speakers at an angle towards the ceiling, just like a real section. A fifth speaker with the high end reduced was fired towards the floor to emulate the body of the violins. This same methodology was used to record reverbs for rock instruments in various LA studios. "Usually the speakers used in these convolution sampling sessions are of average quality because you destroy them occasionally, but that was not a compromise we were prepared to make, we wanted everything to be the best quality possible" said Phoenix. Because of this, the reverbs in Quantum Leap Spaces are the best available, and have a fantastic balance of early reflections and room sound that really draws a dry instrument into the space, rather than the usual "sound plus reverb" result. Quantum Leap Spaces includes a very hi-resolution, true stereo engine that focuses on delivering the very best sound at a very low CPU load. Most impulses are in 8-channel format to accommodate surround mixes. In the end, what makes Spaces unique is that every impulse is special. There is no wading through endless folders of cryptically labeled identical sounding impulses. In fact, Spaces takes the mystery out of choosing reverbs by supplying suitable recommendations for every instrument and style. Quantum Leap Spaces is available for both MAC and PC for $299 MSRP. For more information, or to download a trial version (iLok required) visit http://www.soundsonline.com/spaces.